Gmail users could send images stored on Google+ by adding them directly to new emails. Google was encouraging smartphone and tablet owners to back up their photos automatically to the social network through the Google+ mobile app by offering unlimited storage. Users had access to all the photos that were stored on their Google+ account. It was possible to send an entire album by adding it to a Gmail email. The number of photos that could be added to an email was limited the total size of 20MB, whereas an album could contain a number of images and was sent as a link in the email. Users accessed as many photos that were stored on mobile devices under the Google+ account and had the option to share an entire album. An additional feature included photos being able to be resized in the composed message. The corners of the photo were dragged to the desired size. The new ‘insert photo’ button appeared at the bottom of the message next to the text and ‘send’ button. Google users needed to turn on Auto Backup on their smartphones to enable this function in Gmail. 1. Download Google+ to your Android phone or tablet, iPad or iPhone. 2. Turn on online backup for images in the Google+ app settings. 3. Open a new message in Gmail and click on the camera icon to add an image. 4. Select Google+ to see photos to send. 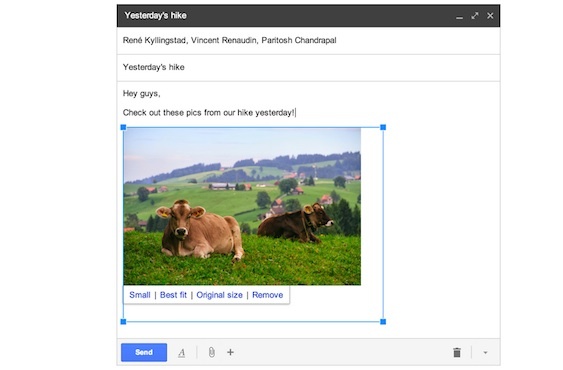 Google started a new experiment in its cloud email service Gmail where promotional emails could be changed from the traditional text list to a colourful grid of square images. The feature was still in testing and users could request access to join the trial. Users in the trial could switch between the traditional and grid view at any time. The new visual resembled the recent release of Google Now Cards for Chrome Desktop. One difference is that marketing emails couldn’t be shifted around by drag and dropping the squared images. The introduction of tabs in Gmail had given users a taste of auto-sorting emails by type, with promotional emails automatically stored in the Promotions tab. Gmail users could add additional category tabs for other incoming messages besides the Primary email tab such as Forums for conversations on online discussion boards and mailing lists, and Updates which featured receipts, bills and cloud software notifications. In the course of your business you will come into contact with many people, only a certain number of whom will become customers. One of the key ways to maximise your efforts in networking is to make sure you’re collecting their details of every new face that comes across your inbox. I’ve mentioned EverContact a couple of times in this series as it is very useful as a set-and-forget way to collect names from emails. But the standard service only runs once every 24 hours, and if you’re into keeping up-to-the-minute records like I am, it’s a little too long to wait. This week I have been trialling EverContact’s browser plugin which immediately adds a contact from any text you select. The text doesn’t have to be an email signature – it can be on a PDF or web page. Just select the words and click the plugin button in the browser menu and a window appears with the data displayed for you to approve. To date it’s the fastest method I’ve discovered for adding contacts to your address book in Gmail (or Google Apps). Users have the option of adding the customer to Google Contacts or to the address book on their computer (a Mac in my case). The latter downloads a .vcf file which on a Mac will add itself to Apple’s Address Book when opened. There are three areas for improvement. The biggest drawback is that the EverContact window takes about four seconds to appear and you can’t click away from the page while this is happening. Perhaps on a quicker connection this would happen faster, but I think most people would expect an instant copy-paste response. My solution is to copy the contact and jump to another tab to continue with another task. The second drawback is that there’s no default setting to send new contacts to Google Contacts. You have to wait until its finished analysing the details and select Google Contacts each time. The third concern is that the plugin only works with the Google Chrome browser. EverContact founder Brad Patterson told me that the plugin had only just been released and there were no immediate plans for other browsers just yet. Despite these issues the EverContact remains the fastest way to add multiple fields of information directly to Google Contacts. There is a Gmail plan which costs US$35 per year for one user and an identical service for Google Apps users which costs US$4 per user a month. Fastest Way to Add Contacts to Salesforce.com? EverContact’s Chrome plugin also works with Salesforce.com, although the process is a little different. Salesforce.com divides its database into leads and contacts, and a user needs to determine how to file each contact. Despite the manual process it is still a very fast way to add a contact from email into your Salesforce.com database. “There’s definitely a need because people are paying three times as much as the Google apps service,” Patterson says. The Salesforce.com sales are driving user growth and revenue for EverContact and it is investing accordingly. What is the difference between Other Contacts and My Contacts? Gmail geeks may have wondered about the difference between two major groups in Google Contacts; Other Contacts and My Contacts. Google defines My Contacts as “addresses you care about” and Other Contacts are simply uncategorised contacts, but there is little written about how the two relate to each other. Other Contacts is essentially a dumping ground of every email address that has been directly or indirectly (CC, BCC) involved with your own email address. Google moves across contacts from Other Contacts to My Contacts of its own accord but hasn’t explained how it does that, Patterson says. “We think that Google has an algorithm so that when you have enough contact they will pull that contact to My Contacts,” Patterson says. He suspects the algorithm works on a number of triggers including the frequency of contact and the amount of information added to the contact’s profile in Other Contacts. If EverContact adds enough information to a contact it will sometimes move it to My Contacts, Patterson adds. I get a special feeling when I find someone who turns out to be a fantastic source for future stories. Journalists rely on sources to break news, unearth unusual angles or get the inside information on a recent event. A good source can be a CEO of a large company prepared to talk frankly about their plans and share their thoughts on the industry. But a great source could also be a junior employee who happens to be a subject expert in a fascinating area. So finding and maintaining sources are a key part of journalism – and an increasingly difficult task given the number of sources and the speed of the news cycle. Long, boozy lunches “building relationships” are pretty much history these days. Media is the same as any other business, except the “special sources” are usually prospective and existing customers. Everyone works hard to gain the sources that will lead to the next sale. Once you have made a good contact you have to do two things – record all their details so you can get in touch as required, and know where they have moved to if they change jobs. After all, if you had sold your services or product successfully, they could encourage their new employer to buy from you as well. Outdated contact lists create headaches as a company gets bigger. A new sales executive might write off an old contact list if the first 10 customers he calls have moved on to different companies. On average, every 30 minutes 120 business addresses change, 75 phone numbers change, 20 CEOs leave their jobs, and 30 new businesses are formed, according to US research conducted by Dun and Bradstreet’s Sales and Marketing Institute. Several apps tackle one or both of those problems. If someone sends you an email in Gmail, Rapportive will show you a photo of their face along with their social media contacts in a pane to the right of your inbox. It will show you if they are nearby, their job profile and employer, and any activity in connected apps such as email marketing tool MailChimp. With one click you can connect to them on LinkedIn or Facebook or look up all your recent email conversations within Gmail. The Evercontact app which works with Gmail, Google Apps and Microsoft Outlook to automatically update the details of any contact who has sent you an email. The app strips information from the email signature and copies it directly to the email app’s address book. The great thing about Evercontact is that once installed it will keep ticking over, building your contacts list without you having to copy and paste phone numbers and addresses. Evercontact has some cool tricks such as mining a year’s worth of emails for contact details, a Chrome browser extension which will save highlighted text to your Gmail, Evernote or Salesforce.com contacts list. Evercontact costs from US$4 per user per month. This is a service under the Salesforce.com umbrella which removes duplicate records, fills in missing information and keeps your contact list in your Salesforce.com CRM generally up-to-date. Salesforce.com claims that by using the service a company can increase sales opportunities by up to 25 percent. An advanced service, Prospector, gives real-time updates and access to a global database of individuals (think LinkedIn) of which you can import 300 records a month. Data.com Clean service starts at US$25 per user per month and the Prospector service costs US$125 per user per month. This post is part of the Cultivate Your Contacts stream in the Future of Work series sponsored by Salesforce.com.